Cast in the eerie shadows of the twin towers of the Limerick Nuclear Power Plant lies the Philadelphia Premium Outlet Mall, a mecca for consumers that in just a few days will cast its siren song southward to lure Black Friday shoppers and welcome their efforts to spur the economy through ritualistic spending at Nike, Adidas, Jockey, Le Creuset and the thankfully curable Perfumania (not to mention food offerings such as the painfully punny Chinese stand called Asian Chao). What was even just a few months ago a barren field now teems with activity, forever in the present with today’s hottest fashions and modern trends. At the exit ramp off of Route 422 drivers are offered barely the chance to turn away from the mall, almost by centripetal force their cars are willed to turn left and ease into the acres of available free parking. But for those who can fight the potent inertia of drastically reduced prices on factory seconds and previous year’s stock (or perhaps more realistically forestall their entry into the maelstrom for a few moments) there is a reward for steering your car to the right at the end of the ramp – The Hilltop Drive-In. In stark contrast to the not so accurately named outlet mall (anyone from these parts will know they are nowhere near Philadelphia, Google Maps pegs it at just over 29 miles from City Hall to the Wilson’s Leather Outlet), the Hilltop sits as a pink-hued reminder of a bygone era and the simple pleasures of a pre-fast food chain dominated burger landscape. Make no mistake, this is not the best burger you will ever eat, but the overall experience makes it well worth the effort and miles. Add equal parts classic architecture, hand-spun milkshakes and malts, black and white photographs and retro signage and you’ve got yourself the ideal destination for a lazy Sunday drive to the far reaches of the suburban Philly telephone area code. I had forgotten the pure pleasure of eating a burger with heaps of mayo on it. Despite the results of A Hamburger Today’s “Favorite Condiment” poll back in August, far too few of the burgers we eat have mayonnaise on them. Why not? 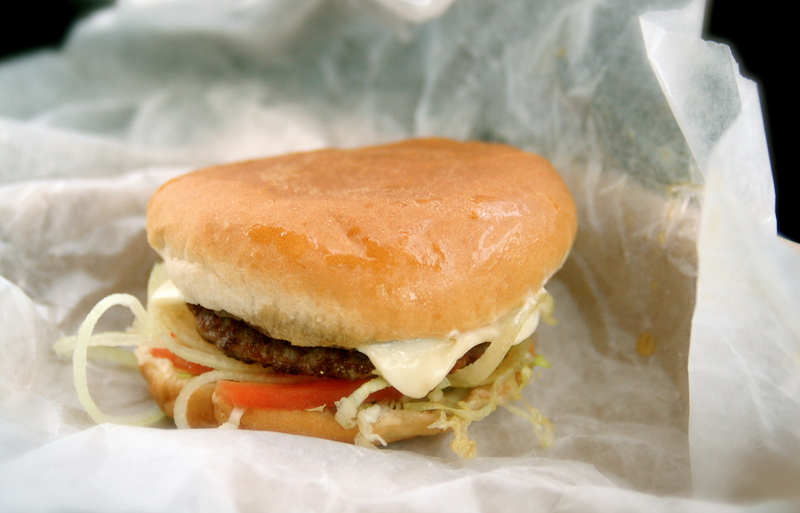 Adding more fat to a burger seems like a no-brainer, and at the Hilltop, which uses some brand that bridges the chasm between Hellman’s egginess and the sweetness of its arch enemy Miracle Whip, the gooey-ness continuum that is created with the inevitable mingling of the white American cheese and mayo is pure perfection. That moment of self-questioning “was that the cheese or the mayo?” works well in the burger as grease delivery vehicle equation. 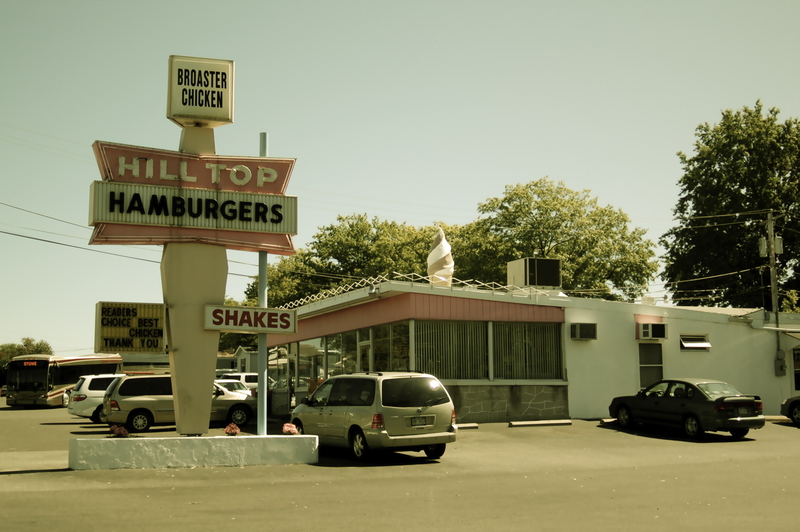 The Hilltop’s roots reach back to the 1950’s when it was a Carvel outpost and the shakes and malts served today are legit. I had a chocolate malt on my first trip and it was perfect, deeply chocolaty with flecks of slightly bitter malt powder. Soft-serve cones and sundaes are available as well and I can imagine in the summer time they do a fare bit of business cooling off the locals with these treats. One of the great surprises of The Hilltop is that they serve Good’s Potato Chips from nearby Adamstown, PA. An old-school producer of no-frills, fried in lard chips, Good’s have become a strictly rationed treat in our house (Philly area folks can get them closer to home at The Head Nut in Ardmore) and as served here are the perfect accompaniment to your burger. They also offer pretty good french fries, McDonald’s style thin cuts fried up crisp and tasty, but when presented with the chip option they slip into second place. Special mention must be given of their crab bisque soup. With our proximity to Baltimore and the Chesapeake Bay, decent crab doesn’t seem like it would be too hard to come across, but it certainly wasn’t expected in this kind of setting and truly stole the show on our first visit. Huge thanks to ModBetty of Retro Roadmap for bringing The Hilltop to my attention via her great post and pictures (special notice should be given of the early ’50’s black and white image she shares of the Hilltop as a Carvel -complete with a rogues gallery of patrons straight out of central casting). Her site is packed with other great info and she is the rare Keystone state resident with actual duckpin bowling experience. We just drove past that wonderful neon sign last night- the place was nicely full for a Monday night, hooray! Glad you liked the Retro Roadmap post on the Hilltop, and crack up like I do at the “California means vegetables” menuism from around here. You were quick on the draw…I just updated the post to mention your affinity for duckpin bowling. I took some photos with my pal’s camera while we were there, here’s a link to her flickr site (she’ll be writing the piece) – scroll down until you see that tasty burger I had and you’ll be sold. Dang, now I’m hungry again! That french fry bag is great, too. Love the typeface. So much easier to rationalize eating a burger than buying a horribly colored and obnoxiously labeled sweater, although it’s likely I’ll do both then next time I’m up this way. Great post.